Ionia bed and breakfast travel guide for romantic, historic and adventure b&b's. 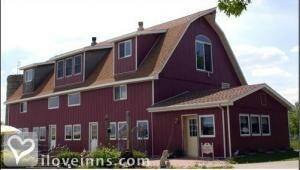 Browse through the iLoveInns.com database of Ionia, Iowa bed and breakfasts and country inns to find detailed listings that include room rates, special deals and area activities. You can click on the 'check rates and availability' button to contact the innkeeper. Ionia is a sparsely populated town in Chickasaw County in the state of Iowa. In the year 2000, when a census was taken, the population of the town did not reach 300 people. Despite its small land area and population, Ionia still manages to have a relatively vibrant economy. It has shops, restaurants, and entertainment centers that visitors as well as the locals have enjoyed. According to most people who come bye for a brief stay here though what makes it distinctly beautiful is the peace and quiet. Because of this, Ionia has been known as an ideal getaway for people who are tired of the hassles of living in huge cities. By The Dairy Barn B&B.